Located on the southern edge of the Caucusus and bordered by Russia, Armenia, Georgia, Iran and the Caspian Sea, Azerbaijan has a centuries old Jewish history. The majority of Azerbaijani inhabitants are Muslims, Armenians and Christian Lezgins. As of 2016, approximately 30,000 Jews live in Azerbaijan. Azerbaijan is 90% Muslim and was at one point a part of the officially Atheistic USSR, so the Jews who reside there currently tend to keep their Judaism to themselves. There are seven synagogues in the country, and Israel has kept an embassy in Azerbaijan since 1992. Jews have lived in Azerbaijan for centuries and can be divided into two groups: Ashkenazi and Jews of Persian origin. Ashkenazim settled in Azerbaijan in the 19th century during a Czarist Russian attempt to infuse Russian culture into the region. Other Ashkenazim came to Azerbaijan during World War II to escape the Nazis. The Persian Jews, also known as Caucasian Mountain Jews, can be traced to Azerbaijan from before the 5th century. Their history is more than 2,000 years long and Azerbaijan has historically been very welcoming toward them. Mountain Jews have lived in Caucasia for centuries and are said to be descendents of the Lost Tribes that left Israel after the destruction of the First Temple, in 587 BC. Their ancestors inhabited southern Azerbaijan, now the northwestern part of Iran, where they adopted the Muslim Tat language, but remained Jewish. The language has evolved to become a distinct Jewish dialect called Judeo-Tat or Judeo-Persian. After fleeing persecution in Persia, many Jews migrated to mountain villages on either side of the Black and Caspian Seas. At the end of the 19th century and the beginning of the 20th, Mountain Jews lived as farmers and gardeners in their small, isolated communities. This historic way of life flourished in the towns of Privolnoe, Krasnaya Sloboda, and Vartashen. Baku, the country's capital, is the home of the vast majority of Azerbaijan's 16,000 Jews. The Jewish community has been able to grow in an environment of governmental tolerance. The new Azerbaijan constitution grants religious freedom and asserts that there is no state religion. However, emigration to Israel, Russia, and Germany has decimated the Jewish community from the 80,000 people present in the early 1990's. While Jews are able to practice their religion more freely today, economics has caused many to emigrate. The Jewish community in Baku has twice as many Mountain Jews as Ashkenazim and about 500 Jews from Georgia. Mountain Jews speak their own dialect called Judeo-Tat and are believed by some to be descendents from the ten lost tribes who were exiled from Israel in 722BCE and settled in the Caucasus Mountains. Others believe that the Mountain Jews immigrated from what is now Iran in the mid-eighteenth century and established Krasnaya Sloboda, around the city of Kuba in the highlands of northern Azerbaijan. According to some, all-Jewish Krasnaya Sloboda once had a population of 18,000, but today, following World War II and emigration, only 4,000 remain. The European Ashkenazi community arrived in Baku in the early nineteenth century, after the annexation of Azerbaijan to Russia. The city boasts three synagogues and ten to fifteen Jewish organizations, including the Baku Religious Community of European Jews, an Israeli center with educational programs, a Jewish Women's Organization, a War Veterans' Society, a Jewish newspaper, the Azerbaijan-Israel Friendship Organization, and the Havva Welfare Center for Women and Children. The American Jewish Joint Distribution Committee operates a Jewish kindergarten, a community center, a Hesed charity center, and a Hillel student center. The Jewish Agency for Israel conducts programs in the city, including a Hebrew-language ulpan, a winter camp for children, and a parents' club, as well as a program to prepare candidates for aliyah. A Hasidic rabbi from Israel is planning a Jewish day school to go along with the city's Hebrew language school. In 2002, the Or Avner Chabad Educational School opened in Baku. The school boasts a mixed secular and Jewish curriculum, freshly cooked lunches, and no tuition. Forty percent of the pupils are of mixed Jewish-Muslim parentage. There is no prayer in school since Azerbaijan’s law on the separation of religion and state forbid it. The school does have a strong nationalist and Zionist ethos. Privolnoe, a remote village in the northern part of the Talysh Mountains, is home to two small communities of Mountain Jews. The Gerim, or Gerei Tzedek, righteous converts, were ethnic Russians who converted to Judaism approximately 200 years ago. They came from the region around the Volga and Don Rivers, Central Russia, and the Northern Caucasus. Little is known about their conversion to Judaism. The Sobbotniks, whose name derives from the Russian word for Sabbath, identify themselves as Karaites. These two groups settled the region in the early 19th century, after being expelled from their homelands. They were granted land by the authorities of the region, who exempted them from taxation and conscription. Thus the area became known as Privolnoe, or free, and grew into the largest settlement of Gerim in Transcaucusus. There are four districts in the town: two Gerim, and two Sobbotnik. The Gerim, who at one point made up 35 to 40 percent of Privolnoe, are Orthodox Ashkenazim, well educated, teach their children Hebrew and send the young men to yeshivot in Russia and Israel. There were once two Ger synagogues, but they were closed down during the Stalinist purges of 1936. Despite having no synagogue and no rabbi, the Gerim, especially the women, remain highly religious. The older generation follows strict kashrut. The Ger community began to disintegrate in the 1960s, when young adults started leaving the community to study in Russian universities. The majority of these students did not return to Privolnoe, and the continuation of this trend has left the Ger population at 20 families. The average age today is 55 and the last Ger literate in Hebrew left the village three years ago. The Sobbotnik community has faired better than their Ger neighbors. They have traditionally followed the word of the bible but not oral halakhic customs. Services are held with mixed seating, prayers are in Russian, and the community strictly follows their own version of Shabbat and kashrut. In the 1920s, a large number of Sobbotnik farmers made aliyah to Israel, but the Sobbotniks have not experienced the same degree of decline as the Gerim have. They have made plans to move as a group to the Northern Caucasus to establish two new Sobbotnik villages, due to economic problems in the region. Kuba was established in 1742 by Fatali Khan as a refuge for Jews throughout his khanate. The small Gudialchai River divides the city in two: the Azaris, Shiite Muslims, live on the northern bank, and the Jews on the southern bank. The Jewish half is known as Yevreskaya Sloboda, or Jewish Settlement. When the Soviets took over, they renamed it Krasnaya Sloboda, or Red Settlement. The Jews of Sloboda come from the highland and valley villages of Kulgat, Kusari, Chipkent, Karchag, Shuduh, and Kryz. In the 1780s, Jews from the Persian province of Gilan also immigrated to Sloboda. Each new group established its own quarter, or mahalla, with its own synagogue named after its hometown. A number of Sloboda residents came from the highland Tati village of Shuduh. An investigation found that one of the Tati Muslim clans is called Israili, and the Muslim Tatis of Shuduh believe that the Jews of Sloboda are their kin, and treat them with special appreciation. Long ago, some Shuduh Jews converted to Islam, while others left the village and settled in the Sloboda. The Tatis of Shuduh and the Jews of Sloboda have maintained a close relationship to this day. In the late 19th century, 972 families of Mountain Jews lived in Sloboda, running eleven synagogues and twenty Jewish schools. Free from the virulent anti-Semitism and pogroms of Eastern Europe, and living peacefully with their Muslim neighbors, the Jewish community flourished. Sloboda became known as Little Jerusalem, as it was the only completely Jewish community outside of Israel. However, when the Soviet Union enveloped Azerbaijan in 1920, the Tat way of life was all but annihilated. In 1928, the Soviets forced the Mountain Jews to change the Tat language from its traditional Hebrew letters to the Latin alphabet. Then, in 1938, the Tats were made to adopt the Cyrillic alphabet and the Soviets closed down their cultural institutions and converted all but one of the eleven synagogues into storehouses and workshops. In 1937, the Communists banned the use of Hebrew, executed five rabbis, and exiled others to Siberia. Despite the atrocities the Soviets brought to Sloboda, Communism guaranteed a job for everyone and enough money to survive, which is not the case in Sloboda today. Economic security was traded in for religious freedom. Also, in 1933, under the Communists, Sloboda's Jewish population peaked at 18,500. After the collapse of the Soviet Union in 1991, Sloboda gradually fell into recession. Jobs were scarce and large numbers of Jews went abroad in search of better economic opportunities, immigrating to Israel, America, and Europe. The poverty-stricken community is dependent on financial support from relatives abroad and Jewish welfare organizations such as the American Joint Distribution Committee. Since the collapse of the Soviet Union, Azerbaijani President Haidar Aliev has returned three synagogues and a Jewish college nationalized by the Soviets, to the Jewish community. 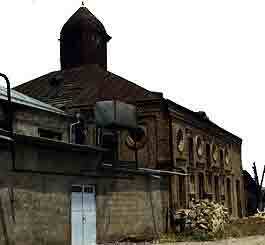 He has encouraged the restoration of these buildings and is well-liked by the Jews of Azerbaijan. Renovation has begun on seven of the original eleven synagogues, including the Gilah synagogue, built in 1896, and the large Kruei Synagogue. Today, Kuba has a Jewish population of approximately 3,000, though the numbers continue to dwindle. In addition, a community of 3,500 Mountain Jews has maintained its historic way of life in the rural regions around Kuba. The survival of these communities is uncertain, as poverty leads many to move in search of economic security. Traditionally, anti-Semitism has not been an issue in Azerbaijan. However, under Communism, the Soviets took over the majority of Jewish property in Baku and Kuba. With the fall of the Soviet Union, many of these buildings were returned. In the village of Auguz, where approximately 800 Jews live, a synagogue was recently returned to the Jewish community and renovated. It was built in 1906 and confiscated in 1930 by the Soviets and, until recently, was used as a warehouse. The Georgian synagogue in Baku was closed in 1991, after many Georgians fled to Israel due to civil war. The shul was reopened in 1996. While Jewish institutions are protected by armed gaurds, Jews feel secure wearing kippot in public. Many cemetery desecrations have also occurred in Azerbaijan. In October 2001, 47 tombstones in the City Cemetery, one of Baku's two Jewish cemeteries, were desecrated. After the discovery of the attack, which reportedly occurred the day after the installation of Israel's current ambassador to Azerbaijan, the Prosecutor General launched a thorough investigation and the Baku Mayor's Office began repairs on the cemetery. The Jewish community has enjoyed warm relations with the Azerbaijani government. Jewish organizations assist the government in caring for the thousands of refugees (mostly from Nagorno-Karabakh) within the country. Since April 1992, Israel and Azerbaijan have maintained strong bilateral relations, making the Asian country one of only a handful of Muslim-majority countries that have diplomatic relations with the Jewish State. Azerbaijan has forged a fruitful relationship with Israel despite the criticism from their Muslim neighbors like Iran and Turkey. The strategic relationship includes cooperation in trade and security matters as well as cultural and educational exchanges. Relations entered a new phase in August 1997 during the visit of then the Israeli prime minister Benjamin Netanyahu to Baku. Since then Israel has been developing closer ties with Azerbaijan and have helped modernize the Armed Forces of Azerbaijan. Israeli military is said to have been a major provider of battlefield aviation, artillery, antitank, and anti-infantry weaponry to Azerbaijan. In May 1999, the U.S.-Azerbaijan Council sponsored a seminar to discuss relations among Azeris, Jews, and Israel. In April 2000, an Israeli trade delegation visited Baku to discuss ways of strengthening bilateral economic relations. For many years, Azerbaijan has maintained high rates of immigration to Israel due to the economic and political situation in the country. In 2002, 475 Jews made aliyah and 111 immigrated to the United States. The Azeri government gets regular updates from Israel regarding Azeri Jews in Israel, who are plagued by unemployment, crime, and other social issues as new immigrants in Israel. Between 2000 and 2005, Israel rose from being Azerbaijan's tenth largest trading partner to its fifth. According to U.N. statistics, between 1997 and 2004, exports from Azerbaijan to Israel increased from barely over $2 million to $323 million, fueled mostly by the high price of oil. Azerbaijan is Israel's top oil supplier as of 2014, providing about 40% of the crude oil for Israel. In order to reduce dependence on oil supplied from hostile countries, Israel gets Azeri oil from a 1,100 mile pipeline connecting Azerbaijan to the Turkish port of Ceyhan. In response to Israel's actions during Operation Protective Edge, many young Azeris demonstrated outside of the Israeli embassy in Baku in favor of an oil embargo against the Jewish nation, chanting slogans like "death to Israel". In 2009, Israeli President Shimon Peres made a visit to Azerbaijan where military relations were expanded further, with the Israeli company Aeronautics Defense Systems Ltd announcing it was going to build a factory in Baku. In 2010, Azerbaijani President Ilham Aliyev issued a decree banning the issue of visas in the country's international airports; foreigners henceforth had to apply for visas at the nearest Azerbaijani consulate. Israel and Turkey were the only two countries whose citizens were unaffected by the new law. In February 2012, Israel and Azerbaijan signed an agreement according to which state-run Israel Aerospace Industries would sell $1.6 billion in drones and anti-aircraft and missile defense systems to Azerbaijan. In March 2012, Azerbaijani security forces arrested 22 people on suspicion of plotting attacks against the Israeli embassy in Baku, as well as a number of other high-profile diplomatic offices. The Azeri national security agency said that all the suspects were trained and financed by Iran. In December 2012, Israel's Ambassador to Azerbaijan Arpaz Rafi noted that trade turnover between the two countries has exceeded $4 billion. Additionally, he said that three documents - in agriculture, facilitation of visa regime for the diplomatic corps, and the elimination of double tax evasion - may be signed next year that will promote the development of economic ties between Israel and Azerbaijan. Israeli Minister of Defense Moshe Ya'alon embarked on a 2 day visit to Azerbaijan in September 2014, in the first visit by an Israeli defense minister to Azerbaijan since the two nations established diplomatic ties 22 years ago. This visit happened to coincide with ADEX-2014, an international arms expo held in the Azerbaijani city of Baku. Azerbaijan is a large importer of Israeli military equipment, and their strategic relations were strengthened by this visit. Since 2012 Azerbaijan has purchased $1.6 billion of military equipment from Israeli Aerospace Industries (IAI). In 2013 Azerbaijan's Foreign Minister, Elmar Mammadyarov became the first Azeri Foreign Minister to ever visit Israel. Israeli Prime Minister Benjamin Netanyahu paid a brief seven-hour visit to Azerbaijan on December 13, 2016. Netanyahu met with Azerbaijani President Ilham Heydar Aliyev, before continuing on to Kazakhstan. According to a report released in February 2017 by the Stockholm International Peace Research Institute (SIPRI), Azerbaijan's military ordered an Iron Dome missile system as well as Tamir interceptor missiles from Israel during the previous year. The Azerbaijani military ordered drones, other missiles, patrol ships, and radars from Israel as well. Annual trade between Israel and Azerbaijan amounts to approximately $5 billion, with Israel importing oil through the Baku-Tbilisi-Cyehan pipeline and exporting tech, medical, and defense equipment.